Wed., Nov. 1, 2017, 6:01 a.m. 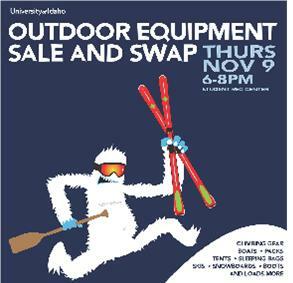 OUTDOOR GEAR -- The University of Idaho Outdoor Program and UI Vandal Ski Team are holding the 43rd Annual Outdoor Equipment Sale and Ski Swap on Thursday, Nov. 9 from 6 p.m. to 8 p.m. in the Student Recreation Center’s MAC court. Admission is free. Anyone is welcome to sell equipment for $5 per table. All sales will be the responsibility of the individual. Proceeds benefit the Vandal Ski Team. The sale also will include equipment from local retailers including Hyperspud Sports, White Pine Outfitters, Backcountry Lark, Alpine Ski Wholesalers and others. Promotional booths will include: Schweitzer Mountain Resort, Lookout Pass Ski Area and Brundage Mountain Resort. New and used equipment found at this sale and swap usually includes skis, snowboards, rafts, kayaks, wet suits, tents, PFDs, sleeping bags, snow shoes, canoes, dry bags, climbing equipment, bikes and other outdoor related items. Info: UI Outdoor Program Office, (208) 885-6810. Posted Nov. 1, 2017, 6:01 a.m.
Rich Landers writes and photographs stories and columns for a wide range of outdoors coverage, including Outdoors feature sections on Sunday and Thursday.